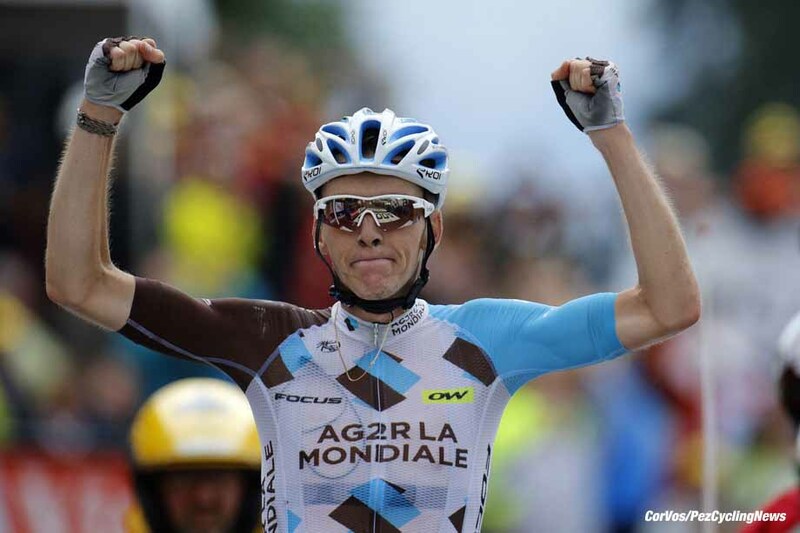 PezCycling News - What's Cool In Road Cycling : TDF’16 St.19: Brilliant Bardet! Race Report: Rain and crashes caused problems for many on stage 19 to Mont Blanc, not least Chris Froome and Bauke Mollema. In the end it was Romain Bardet who was the hero of the day and with the stage win he moved up into second place overall and made France a very happy place. Today was probably the best day on the 2016 Tour de France with an action packed 146 kilometers. The rain played its part in the result and the loss of a few riders, but it was a great day for France and Romain Bardet with stage win and second overall. Chris Froome held his overall lead, but a crash caused him to borrow a teammates bike and struggle to hold the pace to the finish. Hold it he did and looks certain to keep it all the way to Paris. A fairly short stage at 146 kilometers, but with two Cat 1 a Cat 2 and an HC Cat climbs it was not an easy day. From the start town in Albertville the road climbs the uncategorized Collet de Tammié before the first sprint in Doussard after 25.5 kilometers. The first climb is the Col de la Forclaz de Montmin (Cat 1) after 42.5km, 40 kilometers later the peloton crosses the Col de la Forclaz de Queige (Cat 2) before they tackle the big climb of the day; Montée de Bisanne (Cat HC) which is 12.4 kilometers long and averages at 8.2%. 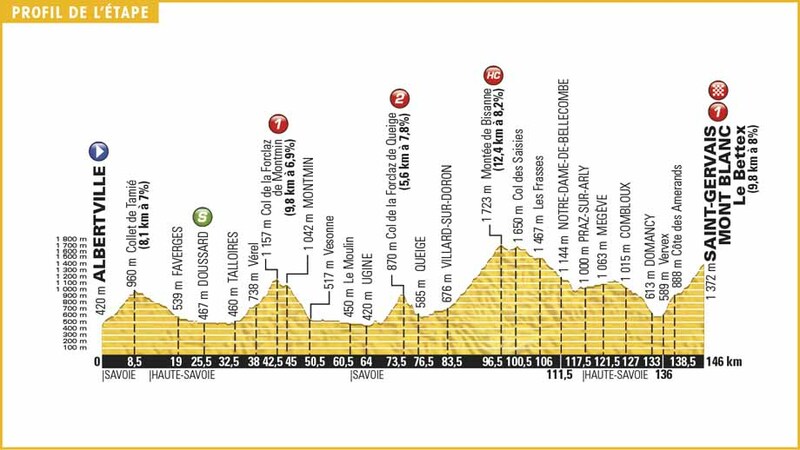 The Bisanne summits at 96.5 kilometers and from there the course mostly descends to Domancy before the final climb to Saint-Gervais Mont Blanc. The summit finish is 9.8 kilometers long at an average ramp of 8%. 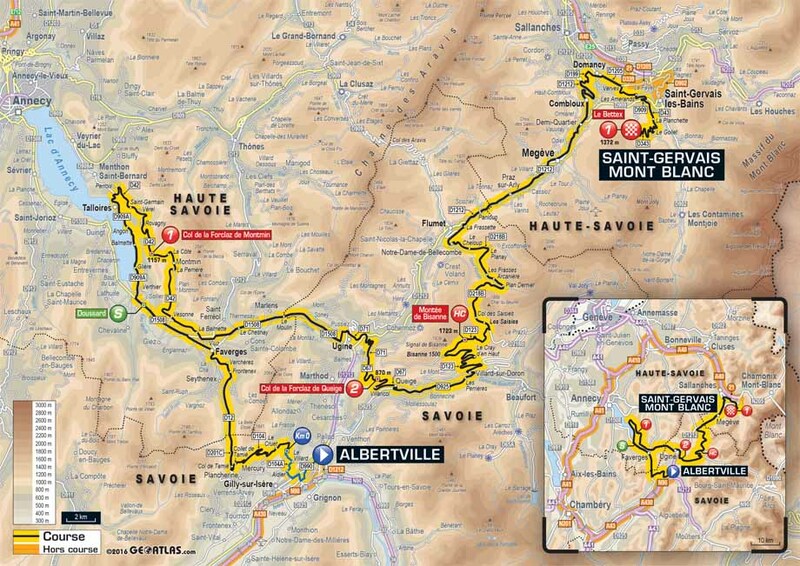 This is the first time the Tour has climbed the HC Montée de Bisanne, but as it is in the middle of the stage it is unlikely to be too decisive. According to the weather forecast there was to be rain and a possible thunder storm at the start, that seems to have passed over during the night, but the grey sky will bring some rain to the finalé. Many riders were warming up before the start, either on the first part of the course or on rollers in-front of their team bus. As expected the break went from the flag and was being powered away by Thomas De Gendt (Lotto Soudal). The KOM jersey of Rafal Majka (Tinkoff) was also visible in the group, there to protect his lead over De Gendt. The break soon had a good lead over the lethargic peloton, the riders were: Alexey Lutsenko (Astana), Robert Kiserlovski & Rafal Majka (Tinkoff), Alexis Vuillermoz (AG2R-La Mondiale), George Bennett (LottoNl-Jumbo), Pierre Rolland (Cannondale-Drapac), Markus Burghardt & Amaël Moinard (BMC), Natnael Berhane (Dimension Data), Laurens ten Dam (Giant-Alpecin), Emmanuel Buchman (Bora-Argon 18), Rui Costa (Lampre-Merida), Thomas De Gendt & Tony Gallopin (Lotto Soudal), Tony Martin (Etixx – Quick-Step), Daniel Navarro (Cofidis), Michael Matthews (Orica-BikeExchange), Eduardo Sepulveda & Vegard Breen (Fortuneo-Vital Concept) and Jarliston Pantano (IAM Cycling. At the intermediate sprint the break had 3:44 as Michael Matthews (Orica-BikeExchange) took the points. The peloton was being towed by Astana, which must have pleased the Sky team as it saved their energies for later in the day. 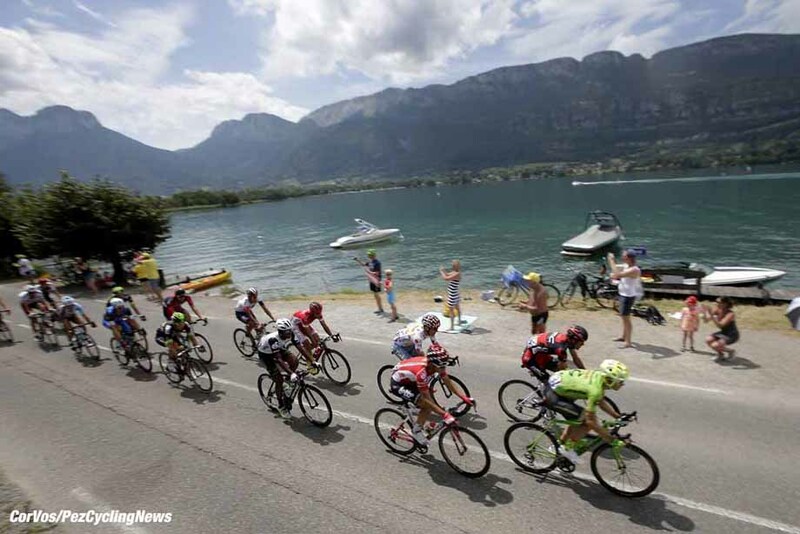 As the race rode past Lake Annecy the lead dropped slightly as Astana did not want the break to take too much time. Astana were keeping the pressure on in the bunch as Robert Kiserlovski was leading the break for KOM, Rafal Majka. The Tinkoff plan didn’t quite work as De Gendt was first over the line with Majka just behind. The break still had 3:20 on the bunch with 100 kilometers still to go. On the descent from Montmin, Majka and De Gendt took a lead over the others in the escape, they were joined by Vuillermoz and the three worked well on the flat section of 20 kilometers before the Cat 2 climb of the Col de la Forclaz de Queige, but were pulled back to the break with 87.5 kilometers still to race and the lead was down to a shade over 3 minutes. Astana were still doing the chase work with a little help from Katusha who had missed the move of the day. Through the feed Astana didn’t slow, making it difficult for everyone to refuel and the gap to the leaders dropped below 3 minutes. As the race started the Cat 2 climb Diego Rosa came to the front of the peloton to tell Andriy Grivko to slow, but it looked like the Ukrainian was not interested in easing up. The pace did drop and by the top of the Forclaz de Queige the gap had again grown to 4 minutes. De Gendt took full points with Majka second. At the back of the peloton, Adam Yates was in trouble, it may have been a puncture, but he needed three teammates to get him back to the safety of the bunch. Soon after Tom Dumoulin (Giant-Alpecin) crashed and eventually abandoned due to a damaged wrist. On the foothills of the Bisanne: AG2R-LaMondiale joined Astana at the front and one of the first riders to ease out the back was BMC’s Tejay van Garderen, but he would have company to the finish as there was a stream of riders letting the bunch go. The escape was also losing riders and the original 20 was down to around 12 as Kiserlovski again kept the speed high for Majka. The main loss was De Gendt who had tried too hard earlier in the stage and was paying for it now. Kiserlovski did a great job of leading most of the way up the Bisanne for Majka to cross the summit solo for full points and (probably) the final KOM jersey in Paris on Sunday. The peloton, which was now down to around 40 riders, was at 1:50 as a small rain shower hit the race. After the top of the Bisanne there was a short climb of the Col des Saisies, Cannondale-Drapac’s Pierre Rolland attacked and was joined by ex-World champion Rui Costa for the descent to Domancy. All was going well until Rolland lost his rear wheel on the damp road and slid off on a corner. The Frenchman had remounted by the time the peloton passed, but it didn’t look good. Costa pressed on as the rain started to fall with a bit more force. Next to crash was Richie Porte, taken out on a corner with a few other riders, the peloton was split by the crash and the Astana riders ease off slightly to allow a certain amount of regrouping. Porte had three teammates with him but he had a battle to get back to the yellow jersey group as Orica-BikeExchange had put Darryl Impey on the front to try and give Adam Yates a gap on the Australian. Eventually with 25 kilometers to go, Porte made it back to the GC group, but it had cost him a lot of energy. Up front Costa had 1 minute on the peloton as he came into the final 20Ks with no other riders between as the remainder of the break had been caught. Another crash took out (amongst others) Dani Navarro (Cofidis) and then the yellow jersey of Chris Froome was sent sliding across the road. Froome needed to change bike with a teammate, but was still close to the GC group. At the base of the final climb, Costa had 1:43 on Chris Froome, but Romain Bardet (AG2R-La Mondiale) was chasing the Portuguese at 40 seconds. 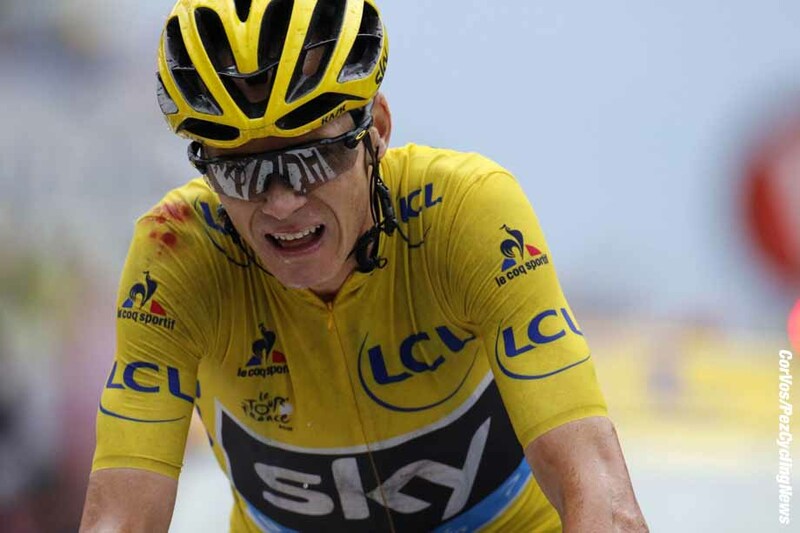 Froome regained the GC group, but the right side of the yellow jersey was ripped and he was riding Geraint Thomas’s bike. Worse luck for Bauke Mollema, he had avoided one of the crashes, but had lost his place with the important group and had no teammates. Bardet caught Costa with 7.7 kilometers to go, the pair had 1:19 on the Froome group. 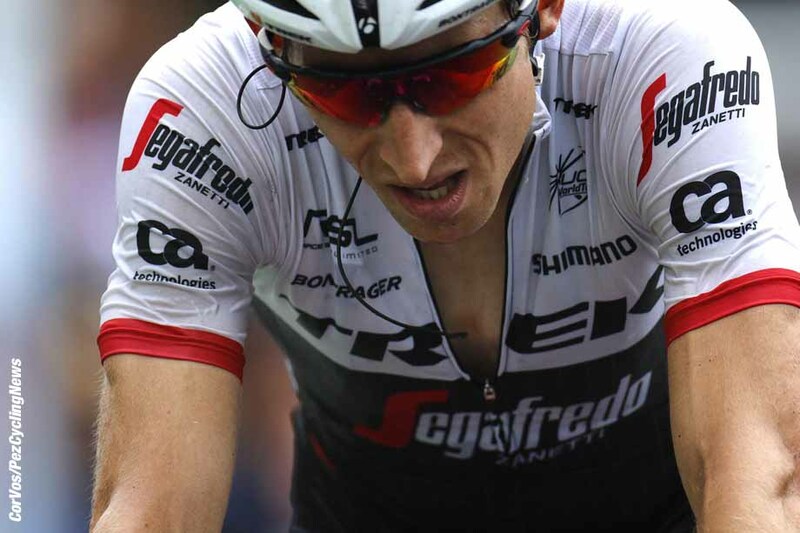 Mollema was fighting a losing battle off the back. Rosa came to the front of the Froome group with Porte and Dan Martin (Etixx – Quick-Step) on his wheel. Froome was not out by any means as Wout Poels brought him to the front to show the others he was still in charge. 5 kilometers to go and the lead for Bardet and Costa was 37 seconds, Mollema was over 1 minute behind the Froome group. Caruso pushed the speed up with Porte on his wheel, Poels was on the move, but Froome let a gap go that Nairo Quintana (Movistar) filled, which kept the group together. Bardet left Costa with 3.2K to go. Porte decided it was time to make his move, but Sky had two men close him down. Next was Dan Martin, this time it was Joaquim Rodriguez (Katusha) who pulled the Irishman back. Young Adam Yates could no longer hold on to the group and lost hold. Control came back to the CG men as Poels set a steady pace which allowed Yates to rejoin. This didn’t last long as Porte and Quintana made another acceleration followed by Fabio Aru (Astana), Froome was close, but obviously not at 100%. Aru jumped to make a gap on the others, this time it was Alejandro Valverde (Movistar) who came to chase and pass the Italian with Quintana on his wheel. Froome was now in more trouble. Bardet was hammering the pedals towards the finish line on the steepest part of the climb, but with the support of an enormous crowd he crossed the line with both arms aloft. Rodriguez, Valverde and Quintana put in a strong final meters which cracks Porte and leaves Froome behind, but it was too little too late to make much difference to Chris Froome’s overall lead. We now wait to see the new overall time difference as Mollema and Yates lost time to Bardet and Quintana. Chris Froome saved his overall lead but, along with the stage win, Bardet has moved into second overall with Quintana now in third. Yates dropped to fourth and Mollema to tenth. Is the 2016 Tour de France now over? Saturday is still a hard day. Ed Hood ‘Roadside’ up soon, so keep it PEZ. 25. Daniel Moreno (Spa) Movistar at 4:49. 25. Tanel Kangert (Est) Astana at 50:39.